Although I wrote everything I know about squirrel issues for this website, oftentimes a problem with squirrels in the attic is beyond the scope of the do-it-yourself homeowner to solve. I have found a professional company in Charlotte, North Carolina that handles problems with wildlife. 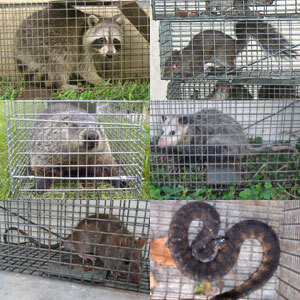 PCA Wildlife, LLC has access to tools, techniques, and experience that help them do a far better job at wildlife removal than a non-experienced homeowner could. They possess licensing that allows them to do certain types of work legally, that non-licensed homeowners in the state of North Carolina are not allowed to do. For the welfare of your situation, and the squirrels, in some cases it's best to hire a pro. There are good companies and bad companies out there. I've done research on such companies, to get to know them, and feel confident recommending their services. I therefore recommend a company called PCA Wildlife, LLC which services Charlotte, North Carolina. If you have a squirrel problem, or any other conflict with a wild animal, and live in Charlotte, I am confident that this company, PCA Wildlife, LLC, is the one to call. I asked the company to describe their service range, and they said this - We service the greater Charlotte NC area, including the towns of Lake Norman, Gastonia, Matthews, Mint Hill, Ballantyne, Pineville, Cornelius, Wildlife Removal USAson, and more! We are located near the border of South Carolina, and our service range includes many SC towns, including Rock Hill, Lake Wylie, Ft. Mill, & Lancaster, SC. PCA Wildlife, LLC operates 24/7, so don't hesitate to call at any time to discuss your wildlife problem, and schedule an appointment for same-day or next-day service. Hi David, I came across your site and need help with flying squirrels. My problem is a little harder to cure because my home is a 200 year old stone house. The type of walls or construction is called a rubble stone. The walls are 24 inches thick and the outside walls are finished stone as is the inside walls. In between the two walls , they threw the rubble stone to fill in. They left lots of spaces for the little critters to run around in. I have caught three with glue traps but have more still running about. Can you give me some help with these buggers. Do those electronic things work for squirrels? Thanks so much. I wanted to send you a compliment on your website. I discovered a mother squirrel was in my attic with babies about four months ago. I was able to trap and relocate the mother and two babies, but the last one decided to leave on its own for some reason, possibly because it witnessed the other three getting trapped. Where are you located? I can use one of the companies you recommend on your site, but figured I'd see if you were close enough since your site was so helpful. I live in Charlotte, NC. Once again, thanks for your website, it was very helpful. If you have a squirrel problem in Mecklenburg County North Carolina, or any other conflict with a wild animal, I am confident that we can solve it. We use humane methods when dealing with Charlotte wildlife removal situations. Squirrel Control Charlotte. Our company is fully licensed and insured in North Carolina. Call us any time at 704-419-8169 for a price quote and to schedule a same-day or next-day appointment to solve your squirrel problem in Charlotte.